Demand for child care in Toronto exceeds the spaces available making it very difficult for families to access the care they need. Toronto also has the highest average child care fees in the country, and recent studies show that both lower and middle-income families feel a great burden because of the high costs. 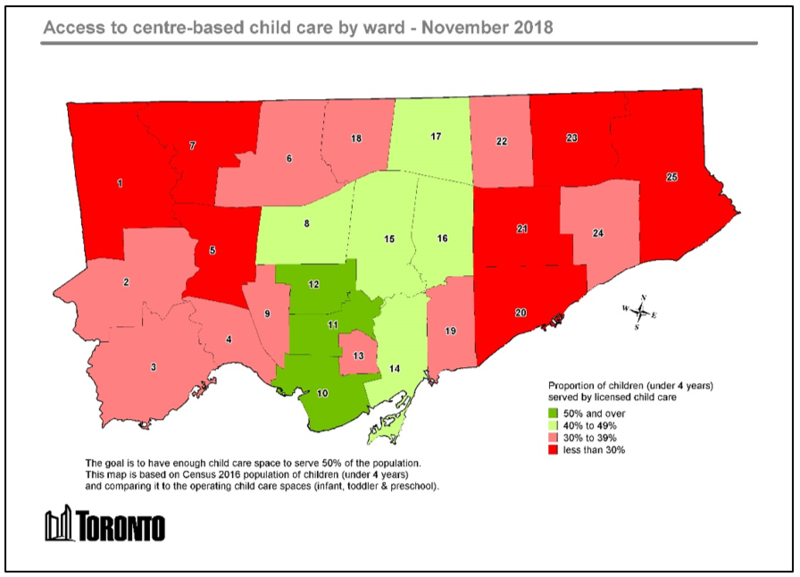 As of June 2018, there were 1,032 licensed child care centres in Toronto operating 73,176 spaces (all age groups), serving only 21 percent of Toronto’s children. Children’s Services, operating under provincial legislation, directly operates 51 child care centres and provides fee subsidies. Children’s Services develops service plans every five years. The current service plan (2015-2019) includes 38 actions. The next plan (2020-2024) is anticipated to be considered by City Council in late 2019. Phase 1 Implementation of the Licensed Child Care Growth Strategy is underway. Phase 2 will begin in 2020. Federal and provincial investments are outlined in Phase 1. The EarlyON Initial Plan, which outlines the transfer and transformation process for child and family centres in Toronto, is underway and covers the period from 2018 to 2020. An update to the Middle Childhood Strategy is expected to be completed in 2019. The Community Recreation Growth Plan 2018-2020 is in the first year of a three-year plan. In 2017, City Council approved a 10-year Licensed Child Care Growth Strategy to improve child care affordability for families, build capacity to meet demand, and support a thriving early learning and care workforce. Child care programs serve children 0–12 years of age and are licensed by the Province of Ontario. Middle childhood programming serve children age 6 to 12. These programs can be licensed or unlicensed. The system of middle childhood programs is currently fragmented and not always accessible to all families. Programs are offered by a range of organizations, including school boards, and funded through different sources and ministries, with fees ranging from no cost to high cost. Early years services are governed by the Ontario Child Care and Early Years Act (2014) through the Ministry of Education. The Act sets the policy framework and funding. The Province of Ontario designates Children’s Services as Toronto’s Service System Manager for child care and early years services. The system includes licensed child care (ages 0-12), before and after school programs (ages 4-12), and EarlyON child and family centres (ages 0-6, parents and caregivers). Children with special needs are supported by service providers specializing in child development and mental health. Children’s Services plans, administers funds, and manages services at the local level and directly operates 51 licensed child care centres and one licensed home child care agency. Funding is from the City, the Government of Canada and the Province of Ontario through the Canada-Ontario Early Learning and Child Care Agreement. Children’s Services also administers income-tested child care fee subsidies to eligible families for all or part of the costs of child care. The City’s 2018 operating budget included 30,490 child care fee subsidies. The City has a service agreement with 702 child care centres and ten home child care agencies for families receiving fee subsidy. All child care centres in receipt of public funding are subject to the AQI and their ratings are posted on the Children’s Services website to assist families to make informed decisions about their child care options. The AQI generates data that is used to support ongoing mentoring, professional development and capacity building for child care staff, to inform strategic planning and policy decisions for growing and improving the sector, and to ensure that public funds are used in appropriate and transparent ways. The AQI has been adopted in three other municipalities in Ontario. Access to quality child care programs and services can impact a child’s health and development, influencing their life outcomes, and the overall well-being of families. The process of assessing quality using the AQI ensures learning environments are places where children can reach their full potential. Accessible child care allows parents, primarily women, to pursue employment, education or training and is recognized as a strong influencer of a healthy economy and as a key factor in reducing the gender gap in today’s labour market. Research commissioned by the City in 2016 showed that licensed child care is unaffordable to over 75 percent of Toronto’s families and affordability and demand are linked: if costs were reduced, up to 50 percent of families would choose licensed care. Research also shows that middle income families are often squeezed out of the child care system, earning too much for fee subsidies but not enough to afford the high costs. Children’s Services has recently implemented a new funding model which provides base funding to child care providers allowing them to reduce or flat line fees and increase wages to advance fairer compensation. The Licensed Child Care Growth Strategy sets a 10-year vision for improving the affordability of child care and increasing the number of child care spaces available for children up to age four with a target that 50 percent of children will be able to access child care by 2026. The Children’s Services capital plan identifies priority areas for development, where access to licensed child care is poorest. Capital funding is through both the province and municipal governments. Over the next three years, 6,883 new spaces will be created. In addition to licensed child care, other before and after school programs serve children ages 4 to 12 outside of school time. These programs do not require a child care license and include programs operated by school boards and authorized recreation and skill building programs by Parks Forestry & Recreation and community agencies. PF&R’s Community Recreation Branch provides 51 low or no-cost after school programs during the school year in high needs areas, serving 1,600 children and youth. In recognition of the unique needs of school-aged children, the City and community partners developed a Middle Childhood Strategy and Implementation Plan in 2012-2013. This strategy is being updated to reflect legislative and service system changes. EarlyON child and family centres offer free drop-in for families and caregivers with children aged 0 to 6. These centres provide a safe, welcoming and inclusive environment that enhances family well-being, strengthens adult-child relationships and fosters healthy child development. The City assumed service system management responsibility for the 52 agencies, representing 275 program sites, which are fully funded by the Ministry of Education, in January 2018, and is developing tools to improve program access and quality. Children’s Services is committed to advancing the quality and inclusion of early learning and child care services to respond to the needs and preferences of Toronto’s diverse families. Through its Every Child Belongs program, the City supports child care programs to be inclusive of all children, including those with special needs. However, special needs funding is not sufficient to adequately support all families and centres. Under the provincial Journey Together program, Children’s Services has worked with Indigenous partners to increase the number of Indigenous-led and culturally relevant child care spaces and expand access to child and family programs for Indigenous children and families who live in Toronto.